When I found out that I was having a little girl, I had visions of Ballet recitals, toe shoes, pink tutu’s, You get the idea. What I got is entirely different, but I would not change either of them for the world. What I got was one Basketball playing, Book reading, Martial Arts loving artist, and one softball player, well they both play softball, but my Youngest, she LOVES it!. Both love their blue jeans. Both are proud to tell any who will listen that they love Superheros, Lord of the Rings, one loves Star Wars, one loves Star Trek, one is a whovian, both love Harry Potter, and there is so much more. They compare belches like the best of the boys, and sometimes to listen to their conversations about “Natural bodily functions” One would swear they were listening to a couple of boys. So here we are, we traded Toe shoes for softball cleats…. and Ballet recitals for Ball games…. and I am loving every single moment!!! Team: 1, 2 Together: 3, 4! instead of Pirouettes, we do Lay ups…. and Makeup? who needs makeup when you have eye black…. and the best cure when getting Hit by a softball? Rub some infield dirt on it…. I am so incredibly proud that my girls have embraced their uniqueness, and have found what they love. I am so thankful and Blessed that God has given me the privilege of being their mom. I LOVE watching them in their elements, and am looking forward to another season of life at the Ballpark, the sights and sounds, the dirt, the sunflower seeds and pickle Pops, the crack of the bat, the friendships made, and the lessons they learn that continue off the field…. My Youngest is as obsessed with American Girl dolls as Her big brother has ever been with any of his obsessions. She has a growing collection of dolls that have been given to her from some very special people in her life…..This is her “doll family”. 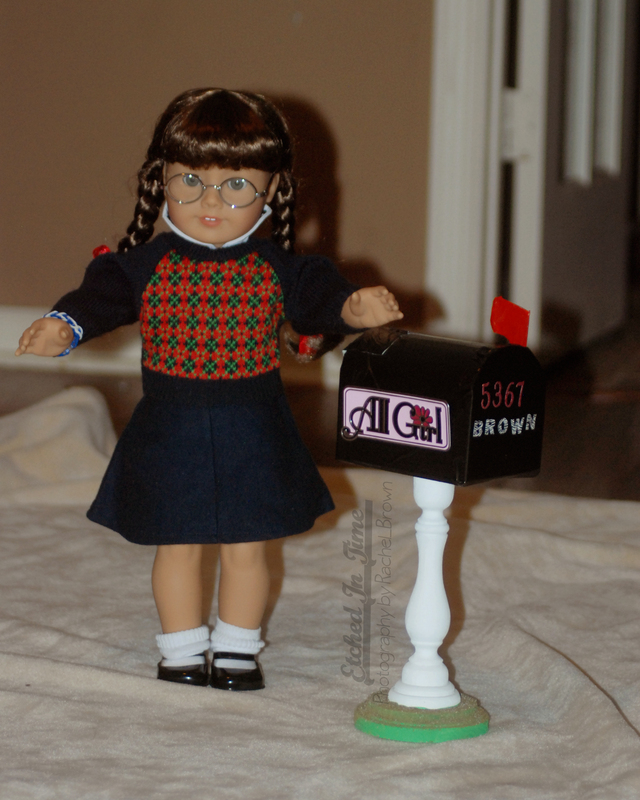 Not all of them are American Girl, but she loves them all very much…. Here she is with Josefina, Isabella, Mary Grace, Molly, Wolfina and Hero bear….These are the ones that take turns going places with her, that are the closest to her heart because of the love that went into how she received each one…. She is always asking for more furniture and accessories, and let’s face it, the stuff is not cheap. SO I headed to Pinterest and started gathering ideas for stuff we could make ourselves. I figured it would save money, and give me and her a way to spend some quality time together. Today started like every Saturday, with her wishing she had somebody to play dolls with, so after breakfast we headed to Hobby Lobby armed with a supply list for 3 simple projects I had found on Pinterest…a suitcase, a mailbox, and a desk/chair set. I didn’t take any photos of the actual crafting process ( yeah yeah I know) because I was having too much fun with my BellaBug, and by he time we were through, my hands were covered in hot pink spray paint, glue, and glitter. All in all it was a Great day, and mission accomplished. My Girl now has some new things for her dolls, and we had a great “Mommy daughter day”, something that was VERY much needed. Between Daddy being in the Military, and being the youngest of 3, and both older siblings being on the spectrum, I often worry that she feels I don’t devote enough time to just her. Today was packed full of memory making, smiles, and quality time with my BellaBug, and I am sure that those memories will long outlast any of the doll items we made today…. Molly with the finished suitcase made from a Plastic Pencil Box…. Oh yes, this would not be complete without Adding the Nintendo ds….